Someone please tell me that the toddler/terrible two's stage does not last forever. Seriously, we have never been through this before because the girls were complete angels. This little boy can really try your patience. If something is in his way he will pick it up and throw it, no matter what the item is. I can't get the boy to sit still except maybe for a meal, but know that he will be back up and running the second he swallows the last morsel. Temper tantrums with back arching and all?? really?? Please tell me he will get some kind of an attention span. Please!! He is still not quite talking as yet. The doctor tells us it's normal and not to worry since he is doing so well in every other way. That's really not good enough for us. William shows that he knows what's going on and can follow commands but still won't speak. It is really frustrating but we continue to do our best working with him. He will occasionally say something out of the blue and we all get so excited. All of my friends and family tell me that before long I will be begging him to shut up and I should enjoy the peaceful quietness while I can. Has anyone had a late talker in the family? Please tell me I am not alone. The back arching! ACK!!! We know those ALL TOO WELL! He also head butts, buries his face and fake cries, lol. He's quite the drama king. Sheliza, boys are different. I always told Chris if the second one was a boy we would have stopped right there because 2 boys would have been quite enough or too much for this mama. The 2s were awful, 3s were bad, 4s weren't good either and 5s are filled with disaster and nonsense. He still throws tantrums occasionally and when he does I leave the house and go to the backyard after shutting all the windows so they neighbors won't hear his stupidness. There was always drama when he was younger. Car-seat drama, parking lot drama, grocery store drama, you name it! It was always a struggle. And the huge difference with him and Alyssa when they are having an episode is that you can reason with Alyssa. She listens, thinks about what you're saying and in most cases will settle down. Christopher screams so loudly he cannot hear you so we don't even try talking to him anymore when he gets possessed with the tantrum monster. I can tell you stories that will scare you :-) especially potty training. I can only hope you don't have half the trouble I had with that, Oh Sheliza, that was a place I never want to go back UGH....Alyssa was so easy to potty train. Christopher took forever and almost put me in the madhouse. I've also been told that the boys are the hardest when they are younger but when they grow up they are so good to their mamas. It's the opposite with girls. They're easier when little. So I'm told......So that's what we have to look forward to. Late talkers are normal. One of my partners had one. I don't think his son spoke anything that the majority of people could understand until he was 5 or so. His daughter could understand him for some reason, but that was about it. However, I would consider that extreme. I would say give him a little time and he'll be chatting you up and your friends and family are right, you will probably wish he was quiet. Girl, the Terrible Twos are nothing! Just wait for what I call the Trying Threes! You are not alone! Bad news first: with boys (I have 3 of them) I feel like the "terrible twos" last much longer than one year, the should call it the "terrible years proceeding 4". But, they do wear off eventually. And, I had a late talker also. 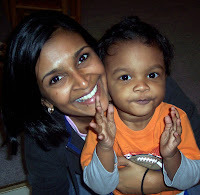 #1 didn't utter his first understandable word (Mama) until he was 18 months. At 2, his preschool teacher asked me if he could talk (at that point he sorta could, he was just VERY timid). He was ahead in all other developmental factors so the doctors let it go for a while. When he did finally start to speak consistently we noticed that he had a bit of an articulation problem and he was treated with speech therapy for a few months. No problems since. He is a happy, talkative 2nd grader now. And, now that #3 is here and has been talking sentences for months already (he's 22 months) I'm longing for the silent days a bit! Nice blog. Glad I stopped by! I can't really say much about the talking my son is turning two in a couple of weeks and talks a little bit but most of it is in his own "language" though he has started to pick up alot of new words (oh I meant commands) this month like "sit down" "eat" "walk" yes my son is very demadning. I totally I mean TOTALLY relate to the throwing. My son will throw anything at anytime anyplace. Cars have flown across resturant floors (we avoid those now, or have a no car policy). He throws fake tantrums when he doesn't get his way, he'll drop down to the floor and scream and cry, kick, throw you name it. I was so unprepared for this. My daugther was like the perfect little angel compared to his craziness. But it never matters who frustrated and angry i get because the little guy will flash is cute little smile - I know he's playing me. The terrible twos don't last forever but the fearsome fours aren't far behind and they are far, far worse. Haha @ the back arching. Yep, we know about that already, and Chase is only 1. He's a handful now, so i just KNOW we've got our work cut out for us when he does reach the Terrible Twos. My mom always said that, of my 3 siblings, I took the longest to talk, and they were beginning to get a little worried. (I think it was particularly odd for a girl, since girls are known to reach developmental milestones quicker, I believe, right?) In any event, she said I was very quiet and wouldn't speak, although it was clear that I understood everything... but she said one day, when I did decide to start talking, the words came out so clearly and articulately and intelligently that everyone was stunned. lol. It was as though I'd "known" how to talk for a while but was just holding back. lol. I always chuckle at that story. Dern, I wish I knew the age. Anyhoo, William is almost there, I feel it. :-) I think the child care at the community center you all just joined will be perfect for him and just the added motivation that he needs!